Billions of farm animals die every year. The ones who escape and capture the public's attention are the ambassadors for the billions slaughtered to be food. The ability of some people to continue to consume meat even after they get a glimpse of a farmed animal’s miserable life and desperate attempt to elude death is itself a form of emotional escapism. But the lucky few animals who do find freedom sometimes free the hearts their human observers as well. The farm escapees sometimes manage to break though more than just a rickety fence; they sometimes manage to knock down the mental and emotional barriers that prevent human beings from seeing “food animals” as unique individuals with a will to live. Cows don’t often make headlines, but when they do, they can make a little history as well. Such was the case in Hopkintown, Massachusetts, when a 1,600-pound Holstein named Emily jumped over a five-foot-high gate at a local slaughterhouse in November 1995 and took off. She hid in nearby woods for weeks, eluding searchers and turning up her broad nose at bales of hay left as bait for recapture. The local paper printed “Emily sightings” and she became the cow celébre for her flight to freedom. Emily’s caper captured the attention and the heart of Meg Randa, co-founder of the nearby Peace Abbey, a multifaith retreat center and school devoted to nonviolence. Randa called the slaughterhouse owner, Frank Arena, and offered to give Emily permanent sanctuary. Arena, at the urging of his granddaughter, agreed to sell Emily for $1. So Randa, her husband, Lewis, and other helpers lured Emily out of hiding and into the Peace Abbey, where she was nursed back to health and spent the next seven years greeting visitors and serving as a living lesson in empathy. 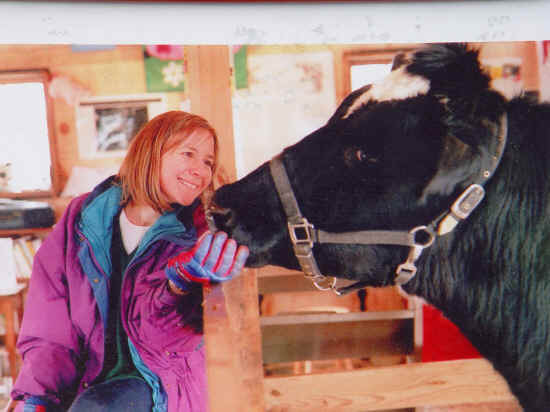 Emily was one of relatively few farmed animals who have escaped from slaughterhouses, trucks or stockyards and attracted so much public attention that they were spared their original fate and instead were allowed to live the rest of their lives in comfort and safety. By luck or by pluck, these individuals manage to beat the system and find lifelong refuge, often with great support from a largely meat-eating public. Farm Sanctuary in Watkins Glen, New York, is home to several escapees. In June 2007, a young lamb broke loose from a South Bronx slaughterhouse and roamed the streets until she was captured by Animal Care and Control workers and taken to the shelter. The New York Times and other media outlets worldwide covered her story, and Farm Sanctuary offered her a home. She was dubbed Lucky Lady, and moved to the upstate refuge to live among several other escapees just as lucky, including a Hereford cow named Maxine who was found in Queens and a goat named Joey who was rescued in Brooklyn. Visitors to Farm Sanctuary, some of whom are already vegetarian or vegan, always hear the stories of how animals arrive at the site. Coston notes that the sanctuary “is not a petting zoo,” and animals who were traumatized by their earlier treatment are not forced to have human contact after they arrive. Cattle raised for beef, including Maxine and two other escapees named Annie Dodge and Queenie, often remain frightened of people. Coston explains that for these cattle, “all touch is terrifying.” After being prodded and shocked and otherwise mistreated by human workers on factory farms and at processing plants, she says, “their response is to get away.” Cows raised for milk usually are more docile because they’ve been handled more often and less harshly. Chickens, geese and other feathered fugitives also find refuge at the shelter, but their stories don’t attract as much attention as the larger mammals because people don’t relate to them as easily. “It’s much harder for people to connect to birds unless you’re around them,” Coston says. But they are no less welcome or valued at the sanctuary. Some meat-eaters occasionally get to know an individual cow, pig or chicken and refuse to consume that particular animal, but have no qualms about eating any of the other 10 billion or so animals slaughtered out of their sight. Small farmers and kids who raise 4-H animals occasionally spare a family favorite. But mass-produced animals on huge factory farms are raised, transported and slaughtered with little or no individual attention. After all, chickens all look alike, don’t they? Likewise pigs, sheep, turkeys and other animals whom most people see only on a store shelf, a menu or a plate, not alive and in person. Meat production is, for human beings, a largely impersonal process. To paraphrase an old idiom, most people can’t see the heifers for the herd. So when an individual animal escapes from a farm or slaughterhouse and literally runs for his or her life, the public has a rare chance to actually consider the fate of that particular animal. In that moment, the cow becomes the underdog—and we Americans don’t eat dogs, do we? Our contradictory consciences get the better of us, and the cow or pig or sheep finds a green pasture after all.